Shin Poong Pharmaceutical said Tuesday that the U.K. 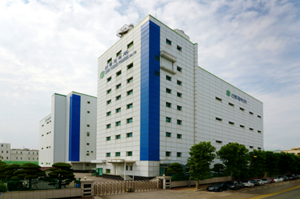 Medicines and Healthcare products Regulatory Agency has approved its clinical trial application for the phase 1 study into SP-8008, an antiplatelet agent for the treatment of thrombotic diseases. Shin Poong''s factory in Ansan, Gyeonggi Province. With the approval, Shin Poong plans to conduct its trial on 48 participants from May or June. SP-8008 is an innovative drug candidate with a new mechanism that is different from existing antiplatelet agents. Usually, physical shear stress activates platelets, which rapidly increases in narrowed blood vessels, such as arteriosclerosis. The symptom does not involve the normal hemostatic effect but acts selectively in pathological thrombus formation. SP-8008 inhibits von Willebrand factor (vWF), an activating substance in the blood vessels, during such process. The drug significantly reduced hemorrhagic side effects in various animal models of disease, while showing platelet aggregation inhibition similar to that of conventional platelet agents. Through the phase 1 clinical trial, the company plans to accelerate the speed of development by enabling preliminary evaluation of efficacy by measuring changes in platelet activity in the blood, Joo added. The Ministry of Health and Welfare funds SP-8008 as a high-tech medical technology development project. Professor Jung Jin-ho of Seoul National University College of Pharmacy and Professor Lee Ki-ho of Korea University College of Pharmacy are jointly developing the drug.